Australia is known to be the paradise for tourists and travelers. It has something or other to offer to the travelers of all kind. Whether you love beaches, or the wildlife, food and wine, or the classic sceneries and monuments, Australia has everything to make your trip special and memorable. 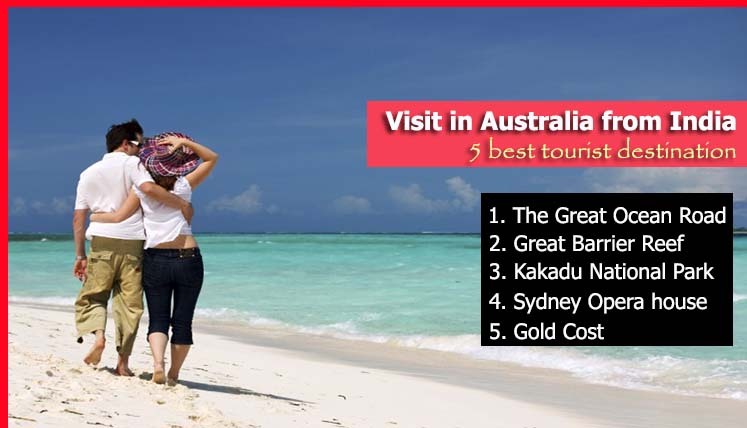 Let’s take a look at the five best tourist destinations in Australia, you would want to visit in your life time. Apart from the glamour and lifestyle of Australia, here are the five key destinations you would want to visit for sure. The Great Ocean Road, as the title suggests, is a 243 km drive along the most amazing southwest coastline of Victoria. This coast line start from Torquay and ends in Allansford. While driving through this beautiful coastline, you are promised to see some of the most incredible landscape beauty, sceneries and wildlife of Australia. The famous Australian Kangaroos, emus and seals, you will get to see all such incredible animals during your journey. Also Read – What is next up for IT Professionals in India after Australian 457 Visa Ban? If you are fond of watching marine life, the trip of Great Barrier Reef can offer you the lifetime opportunity to get a real closer look at the underwater beatify of marine life. It’s the 3000 km marine park parallel to the cost of Queensland. You can enjoy the full day diving tour at the Great Barrier Reef or can experience the adventurous helicopter flight over this incredible place of Australia. You can fly directly to Cairns International airport to make your way to the Great Barrier Reef. The Kakadu National Park- an incredible nature reserve in northern territories of Australia perfectly represents the wildlife attractions of Australia. Explore this open-air zoo with cruise ride to get a far closer look at the incredible sea eagles, reptiles, pelicans, egrets, Snakebirds, crocodiles, etc. Well, this incredible performing art center in Sydney doesn’t need any introduction. Its also popular as the one of world’s greatest architectures. You can experience the mesmerizing tour inside the Opera House, which includes, concert hall, theaters, studios, exhibition and cinema hall, etc. The surrounding locations of Opera House are equally beautiful whether it is a tour of Royal Botanic Garden or lunch in a restaurant or a boat ride along it. The Gold Cost is the beautiful coast city in Queensland. If you love beaches, water sports, surfing, this place is for you. You can also enjoy a visit to local theme parks, i.e. Dreamworld, Sea World, etc. There are multiple things to do in this tourist city, i.e. enjoy a ride on hot air balloon, visit the near wax museum, take a trip to canals in aqua bus, etc. Encouraged enough for a lifetime trip to Australia? Well, the first step would be to apply for the relevant tourist visa in Australia. Get the best support and assistance from a certified and registered Australian Visa Consultancy Service to apply for tourist visa in Australia.